It turened out amazing! I was really worried when I placed the order because I did the custom order. I have a large chest and smaller waist. And only 5 ft. So it made more sense for me to do the custom than have to order than alter it more when it arrived. And I’m so glad I did. I am so happy with the outcome it fit great!! The only thing I would do differently is go to a seamstress to get my exact measures and add it in. I did my own and when I entered it in I added .5 because I was worried with it being online and not being exact. 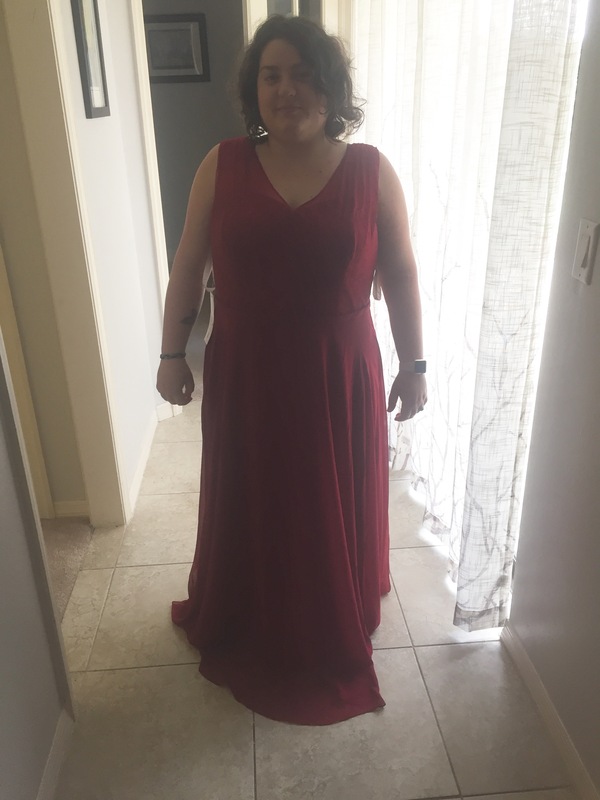 I am so glad I went with the custom sizing- my dress fits perfectly! In addition to being more affordable than most other retail bridemaids' dresses, it was great to have the option for custom sizing so that I didn't have to spend any additional money on alterations. Despite getting a custom dress, it only took about 6 weeks for arrival. Highly recommend! Chest padding was way too large even though I did custom sizing. There was way too much lining material under the lace so it bunched up and is costing a lot to alter given the odd construction of the top. The wiring isn't too uncomfortable but I am taking it out because you can see it sticking out in pictures. Skirt material is clingy and wrinkles easily. The dress is beautiful and exactly as pictured. I love that it has pockets. The material is very good quality. I have very sensitive skin and was nervous about the lace detail on the straps that is not lined. The lace is soft enough that it does not break my skin into a rash. I did the custom size and I still had to get a few alterations mostly in the straps and bust area. The length was perfect! Ordered this one so my daughter could see the burgundy in a bigger item then the swatch. Was not disappointed. Azazie is the best! I chose the Eileen in sky blue for my wedding. Out of nine orders, all of them came in earlier than expected. After placing the order, Azazie sent emails keeping me updated along the way. 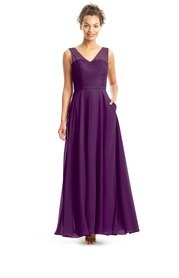 My bridesmaids loved the beauty and the quality of the dresses, not to mention for such a reasonable price! They also adored having pockets to stick their phone in for the big day. They looked stunning. Overall, I was extremely happy with the company and the dresses! One suggestion: You need more sample dresses. I strongly disliked having to get "luckY" by refreshing the website everyday for three weeks trying to get a sample dress. That was the only stressful party of this experience. I would recommend either A). Offer $5 back to every dress sold if they send it back after the wedding in good condition, or B) create a waiting list for the bride. Otherwise, I am recommending Azazie to every bride I know!